No matter what, It’s important to remember that sugary sweetness is not reserved for distant memories alone… but for new ones made in ways you dont necessarily see “in the moment”. 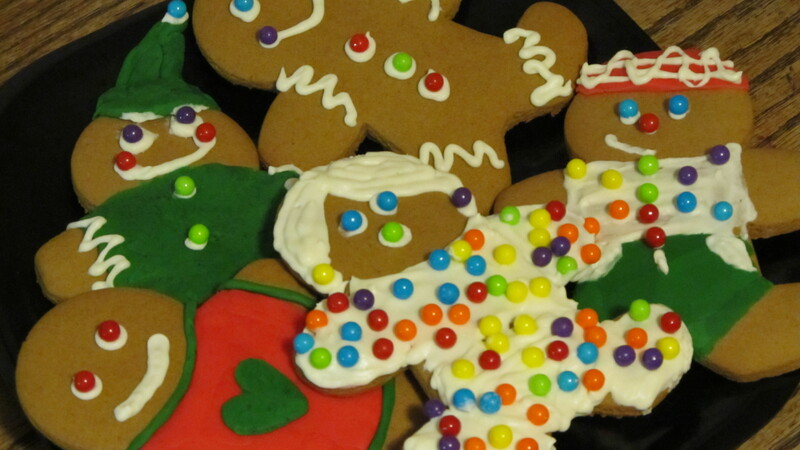 Looking back on today, I will choose happily to forget the mess, the insanity, and the obvious lack-of-my-mind when beginning a huge cookie decorating assembly line in my LIVING ROOM! That’s right… My tiny kitchen is just that, tiny. It’s hard enough to use the mixer on the counter, find a way to get sticky dough onto hot stone cookie trays, and get things in and out of the oven without adding 3 sets of excited and eager helping hands. So the decorations moved to the living room… all the better to watch the traditional 5th or 6th rerun of ELF (a family favorite Christmas movie) while we work. (But yes, to be honest) …it is a tad scary not to obsess about what the living room will look like after – later – when the memories are NOT being made. Ah, but that is a worry and concern for another time. Not one to tarnish the memories being made NOW. So as we went along, with the occasional spat at who was taking too long with the icing thing-a-mabob and who used the most of the treasured snowflake sprinkles, we sealed in sweet cement our memories of another Christmas together, one where my kids are young and still call me Mommy, not Mom or “Hey You”. It doesn’t even much matter what the cookies look like, all that matters is how yummy they taste going down. All that mattered today was that I held my kids tight in my heart and they stayed little with magic in their eyes while making our cookies and the famed gingerbread house. Today a torch was passed… I relaxed and let go of the icing decorator cone and let Lindsey do the biggest job. Then, with pure joy, each kiddo took their turn and we let perfection go by the wayside and instead made some of the best and sweetest memories we ever have. OH did they taste good going down! 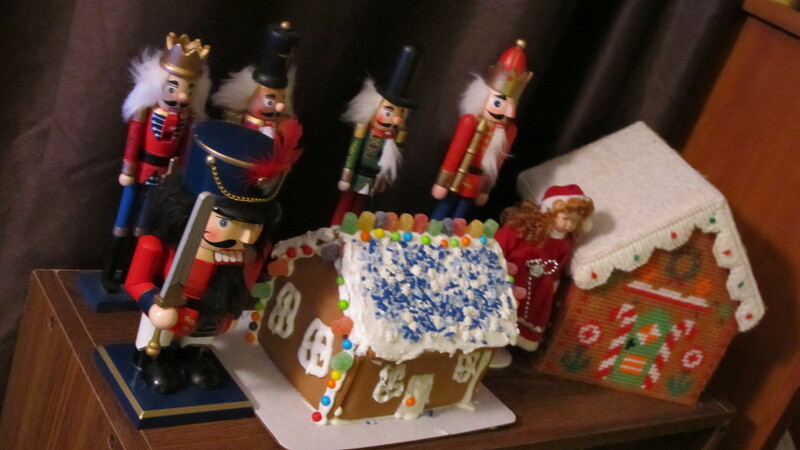 The Gingerbread house sits protected by an army of Nutcrackers and cozy next to the house my Grandma made me before she passed away. 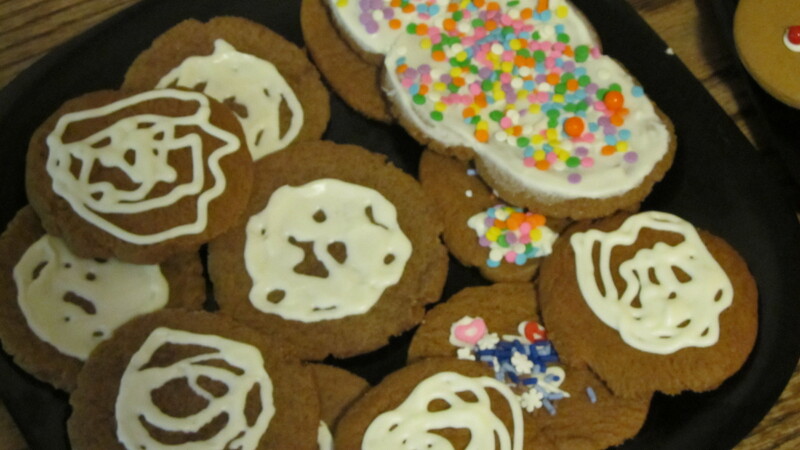 Nearly half the cookies slid down to our tummies, and are no more. Just a plate full remain and some of those are already reserved for Santa! All this is to say – enjoy your traditions, and if you don’t have any yet – start some. There’s no time better than the today to begin to enjoy life. It sounds like you have the good sense to relish this time while your kids are little. What I wouldn’t give to be called “Mommy” again. It sounds like whatever mess was made was well worth it. Thank you for sharing some of your “good stuff”.